The former Bahmani provincial capital of Bijapur remained the capital of the Sultanate throughout its existence. After modest earlier developments, Ibrahim Adil Shah I (1534–1558) and Ali Adil Shah I (1558–1579) remodelled Bijapur, providing the citadel and city walls, congregational mosque, core royal palaces and major water supply infrastructure. Their successors, Ibrahim Adil Shah II (1580–1627), Mohammed Adil Shah (1627–1657) and Ali Adil Shah II (1657–1672), further adorned Bijapur with palaces, mosques, mausoleum and other structures, considered to be some of the finest examples of Deccan Sultanate and Indo-Islamic Architecture. A painting of "The House of Bijapur" was completed in the year 1680, during the reign of Sikandar Adil Shah the last ruler of the Adil Shahi dynasty. Ibrahim Adil Shah I who succeeded his father Ismail, fortified the city and built the old Jamia Masjid[clarification needed]. Ali Adil Shah I who next ascended the throne, aligned his forces with other Muslim kings of Golconda, Ahmednagar and Bidar, and together, they brought down the Vijayanagar empire. With the loot gained, he launched ambitious projects. He built the Gagan Mahal, the Ibrahim Rauza (his own tomb), Chand Bawdi (a large well) and the Jami Masjid. Ali I had no son, so his nephew Ibrahim II was set on the throne. 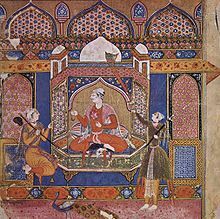 Ali I's queen Chand Bibi had to aid him until he came of age. Ibrahim II was noted for his valor, intelligence and leanings towards the Hindu music and philosophy. Under his patronage the Bijapur school of painting reached its zenith. Muhammad Adil Shah succeeded his father Ibrahim II. He is renowned for Bijapur's grandest structure, the Gol Gumbaz, which has the biggest dome in the world with whispering gallery round about slightest sound is reproduced seven times. He also set up the historical Malik-e-Maidan, the massive gun. In the second half of the 16th century, and the 17th century under the aegis of Adil Shahis, the capital city of Bijapur occupied a prominent place among the celebrated cities of India. It was a great centre of culture, trade and commerce, education and learning etc. It was known for its own culture called, Bijapur Culture. During Bijapur's heyday of glory there was a conflux of different communities and the people. Sometimes in many respects it surpassed the great cities of Delhi and Agra of Mughal India. Before Yusuf Adil Shah, the founder of the Adil Shahis could make Bijapur as capital of his newly carved kingdom; the town occupied a considerable importance. The Khaljis made Bijapur their governor's seat, and after sometime Khwajah Mahmud Gawan, the Bahmani premier constituted Bijapur region into a separate province. He owned property in Bijapur called "Kala Bagh". He constructed a mausoleum of Ain-ud-Din Ganj-ul-'ullum. The architecture of the mausoleums of Zia-ud-Din Ghaznavi, Hafiz Husseini and Hamzah Husseini etc. suggests that these edifices belong to the Bahmani period. Thus Bijapur was fairly large town under the early Sultans of Adil Shahi dynasty. The capital progressed slowly, however its star was in ascendancy since the accession of Sultan Ali Adil Shah I in 1558. His victory in the Battle of Talikota in 1565 and further campaigns in the Krishna-Tunghabhadra regions brought enormous wealth. Hence he began to spend lavishly on its decoration. Under him every year saw some new building, a palace, a mosque, a bastion, or a minaret peeping up its proud head triumphantly. His successor Ibrahim Adil Shah II added, so to say, a pearl necklace, Ibrahim Rouza to enhance the beauty of Bijapur, and Mohammed Adil Shah crowned it with a priceless gem called Gol Gumbaz. Thus the Adil Shahi monarchs poured their heart and soul in the capital city. The period between accessions of Ali Adil Shah I 1558 to the death of Mohammed Adil Shah 1656, can be called the golden age of the Adil Shahis as the kingdom flourished in all walks of life. Similarly, Jean Baptiste Tavernier, who visited India between 1631 and 1667, was a jeweller, probably he had been to Bijapur for selling some of his jewels. He has left for us an account, in which he describes Bijapur was a great city ... in its large suburbs many goldsmiths and jewellers dwelt ... the king's palace (Arkillah or citadel) was vast, but ill-built and the access to it was very dangerous as the ditch with which it was girt was full of crocodiles,. in the same way, the Dutch traveller, Baldeous, the English geographer, Ogilby and others praise the greatness of Bijapur. Before the Muslims could establish their rule in Bijapur, it was a great centre of learning in South India. It is evident from the bilingual Marathi-Sanskrit inscription, which is inscribed just under the Persian epigraph in the Karimuddin mosque 16 that the city of Bijapur is given the title of ‘’"Banaras of the South"’’. Since ancient time Banaras in northern India was a celebrated centre of learning. The Khaiji governor of Bijapur, Malik Karimuddin, probably found at this place the great activities of learning; hence he entitled Bijapur as the Banaras of the South. 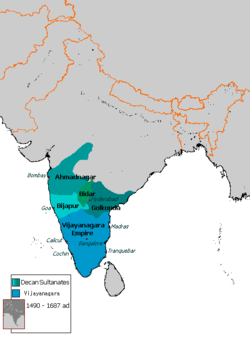 The Khaljis conquered whole south India and they were well acquainted with its famous cities like Daulatabad of Yadavas, Warangal of Kakatiyas, Dwarasamudra of Hoyasalas and Madurai of Pandyas. However, they did not entitle any of these cities as the Banaras of the South, except Bijapur, though these cities were the capitals of ruling dynasties. During the rule of Bahmanis Bijapur retained its academic excellence. The renowned learned Sufi of India, Ainuddin Ganjuloom Junnaidi, who authored 125 works of Qur’anic commentaries, Quirat (art of Quranic recitation), Hadith (prophetic Traditions), Scholasticism, Principles of Law, Fique (Islamic Law), Suluk (behavior). Syntax, Lexicography, Ansaab (genealogy). History, Tibb (medicine), Hilmat, Sanf (grammaIj), Quasidah, etc. lived in from 1371, until his death in 1390. His disciple and other Sufis like Ibrahim Sangani and his sons, Abdullah AI-Ghazani, Ziauddin Ghazanavi and Shah Hamzah Hussaini kept their noble litterateur's traditions alive in Bijapur. Under the aegis of Adil Shahis of Bijapur advanced very much in the field of learning. It was considered as the 'Second Baghdad' in scholastic activities in the Islamic world. Owing to its popularity in this sphere Ibrahim Adil Shah II named it ‘’”Vidhyapur” All Sultans of Bijapur were men of letters. Ali Adil Shah I was well versed in religion, logic, sciences, syntax, etymology and grammar. He was fond of reading to the extent that he kept with him big boxes of books, while on tour. All Sultans patronised the teachers and scholars. It was routine in the capital that the scholars met at different places, and among them learned discussions were held. At the capital the Royal Library was existed in which nearly sixty men, calligraphers, gilders of books, book binders and illuminators were busy doing their work whole day in the library. Sesh Waman Pandit was the Royal Librarian. Ibrahim-II's court poet Baqir Khurd-e-Kasm worked as transcriber in the Royal Library. The noted scholars in the capital were Shah Nawaz Khan, Abdul Rasheed-al-Bastagi, Shah Sibagatullah Hussaini, Shaikh Alimullah Muhaddis (a teacher of Sayings or Traditions of Mohummad, and Theology in Jumma mosque), Mullan Hassan Faraghi, MullanHabibullah, Shah Mohummad Mulki and Shah Habibullah Hussaini. Shah Zayn Muqbil, a great lover of learning and books, had eight hundred manuscripts in his library, out of these over three hundred were written by him. Miran Mohummad Mudarris Hussaini was also a great teacher. At the Asar Mahal there were two Madrasas (religious schools), one for teaching Hadith (Tradition) and another for Fiqah and Imaan (Theology and Belief). Free education with delicious food, and stipend of one Hun to each student was provided. The Mosques had the Maktabs (elementary schools) where Arabic and Persian studies were taught. The state supplied books free of costs. The students who performed excellently in the annual examination, received prizes in Huns, and later appointed in high and honourable position. Besides these, most of the Sufis maintained their own Khankhas (convents for disciples) and Kutub Khanas (libraries). Even to this day some of the descendents of Sufis in perpetuity continued this tradition. In consequence of state patronage, a bulk of literature in Arabic, Persian and Dakhani Urdu had come up. In addition, the languages like Sanskrit, Marathi and Kannada flourished. Pandit Narhari, a court poet of Ibrahim Adil Shah II, composed the poetic excellence on his master, called, 'Nauras Manzarf’. Shri Laxmipathi, a disciple of Pandit Rukmangada composed a number of Marathi and Hindi devotional songs set in musical Ragas. Swamy Yadvendra was also a prominent contributor in Marathi literature. In the south of kingdom, the official transaction was carried out in Kannada. A manuscript depicting the ruler of Bijapur in the year 1591, Ibrahim Adil Shah II. It is said that in the year AH 1142 Adil Shah used to frequently view these strands of hair. On one occasion he asked all the Sufis of that time to come and see them. So Hashim Husaini and Sayyad Shah Murtuza Quadri came there and asked to open the boxes; they were opened in front of the noble persons. But as they were opened a bright ray was everywhere. Nobody could bear the brightness of the ray and they all became unconscious. Everywhere there was a perfume and then everybody saw the hair. After that period it is said that the boxes were neither opened nor had a privilege . ^ Baqir, Muhammad. "BĪJĀPŪR – Encyclopaedia Iranica". www.iranicaonline.org. Encyclopedia Iranica. Retrieved 8 February 2017. The official language of the court at Bījāpūr during the ʿĀdelšāhī period and until the end of Mughal rule in 1274/1858 was Persian. Indeed, Yūsof ʿĀdelšāh (895-916/1489-1510) and his son Esmāʿīl themselves wrote poetry in Persian, Esmāʿīl under the pen name Wafāʾī. The ʿĀdelšāhīs established Shiʿism in Bījāpūr and actively encouraged the immigration of Persian writers and religious figures. ^ Alam, Muzaffar (1998). "The pursuit of Persian: Language in Mughal Politics". Modern Asian Studies. Cambridge University Press. 32 (2): 317–349. doi:10.1017/s0026749x98002947. ^ Salma Ahmed Farooqui, A Comprehensive History of Medieval India: From Twelfth to the Mid-Eighteenth Century, (Dorling Kindersley Pvt Ltd., 2011), 174. ^ Sen, Sailendra (2013). A Textbook of Medieval Indian History. Primus Books. p. 119. ISBN 978-9-38060-734-4. ^ The Peacock Throne by Waldemar Hansen. ISBN 978-81-208-0225-4. Page 468. ^ Chaurasia, Radhey Shyam (2002). History of Medieval India: From 1000 A.D. to 1707 A.D. p. 101. ^ Subrahmanyam, Sanjay (2012). Courtly Encounters: Translating Courtliness and Violence in Early Modern Eurasia. p. 101. ^ Salma Ahmed Farooqui, A Comprehensive History of Medieval India: From Twelfth to the Mid-Eighteenth Century, (Dorling Kindersley, 2011), 174. ^ John Cornforth, Mausoleums and Minarets, Bijapur, India-II, Country Life, March-11, 1982. ^ a b Busateenus-Salateen a Persian Manuscript of Mirza Ibrahim Zubairi. ^ Gribble, J.D.B. History of the Deccan, London 1896. ^ Bijapur Map, Astrological Museum, Bijapur. ^ Schweitzer C, Muslim Water Work, 1939. ^ Sykes, W.B., Notes Respecting the Principal Remains in the City of Bijapur. 1819. ^ Dr.Nazim, M., Bijapur Inscription, 1936. ^ a b c Mirza Asad Baig, Wakiyat-e-Asad Baig or Halaat-e-Asad Baig, Asad Baig’s Mission to Bijapur, 1959. ^ a b Rafiuddin Shirazi, Tazkiratul Mulk. ^ a b c d e Mirza Ibrahim Zubairi, Rouzatul Auliya-e-Bijapur. ^ Dr.Davare, T.N., A short History of Persian Literature. ^ Askari Hasan, Medicine and Hospitals in the Muslim India, 1958. ^ Siddiqui M.A., The Unani Tibb (Greek Medicine) in India. ^ Muhammad Qasim Firishta, Dastur-e-Atibba. ^ a b Nooruddin Mohammad Jahangir, Tuzuk-e-Jahangiri. ^ Shaikh Muhammad Aslam Razvi. ^ Muhammad Qasim Firishta's Tarikh-e-Firishta.